What’s Questland without quests? 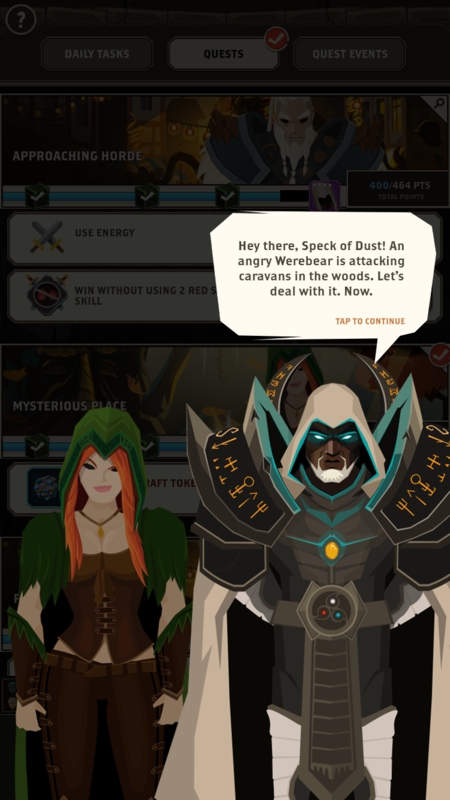 Find out more about quests and their fresh new look in the upcoming update! A Heroes journey is all about completing quests and becoming more powerful than they were before they started. In Questland, there are plenty of quests to do, be it daily tasks or specific goals you have to complete. With the Swords and Spirits update, we’ve reworked quests to make them more enjoyable and user-friendly. 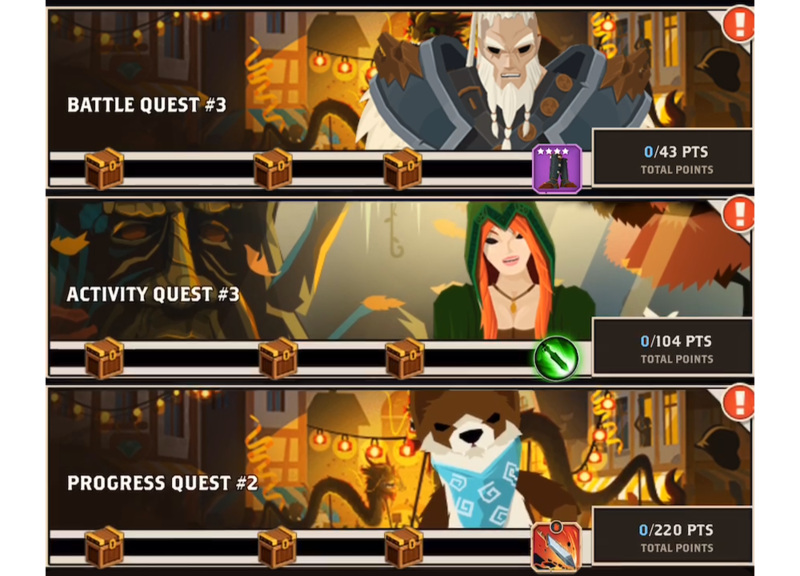 We’ll be going over the fresh new look of quests and what to expect! There are three tabs of quests. All of them can be found by going to Quests on the bottom of the screen. Daily Tasks will now change from day-to-day. This will keep you on your toes and make you feel like each day there is something new to conquer. Newer players will have a handful of tasks to do. As you level up and your Hero progresses, you’ll see more tasks and more rewards that can be earned from the Daily Tasks tab. Every milestone rewards you with additional XP, so be sure to complete them every day to make your Hero stronger! Each task awards you with points. 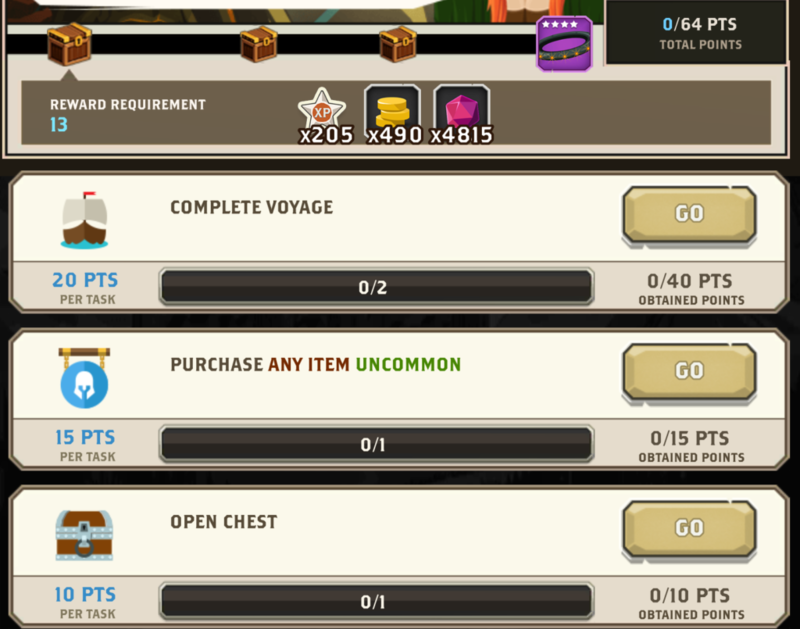 For example, Complete Voyage has a limit of 5, and will grant you 20 points each. This makes for a total of 100 points you can earn through this task. 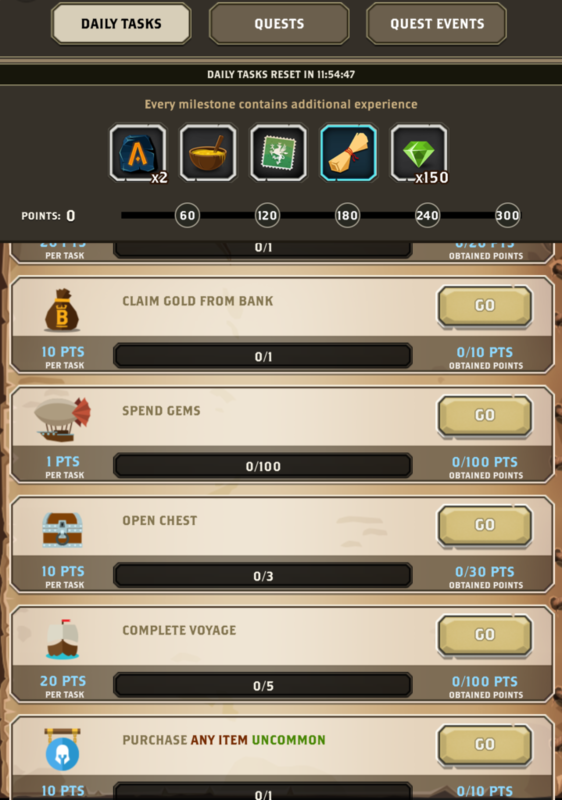 To receive rewards, you must complete the different tasks to earn points and reach the different point milestone rewards. This tab will now have three different groups of quests. Each group has a unique theme of tasks to complete. These quests are given to you by different NPCs and will have small story-line dialogue upon completion. Having three types of groups for quests make it so that you always having something to do in Questland. Even if you aren’t slaying monsters, you can still progress your Hero through other means by completing tasks from the different groups. These quests are all similar in how you obtain rewards. 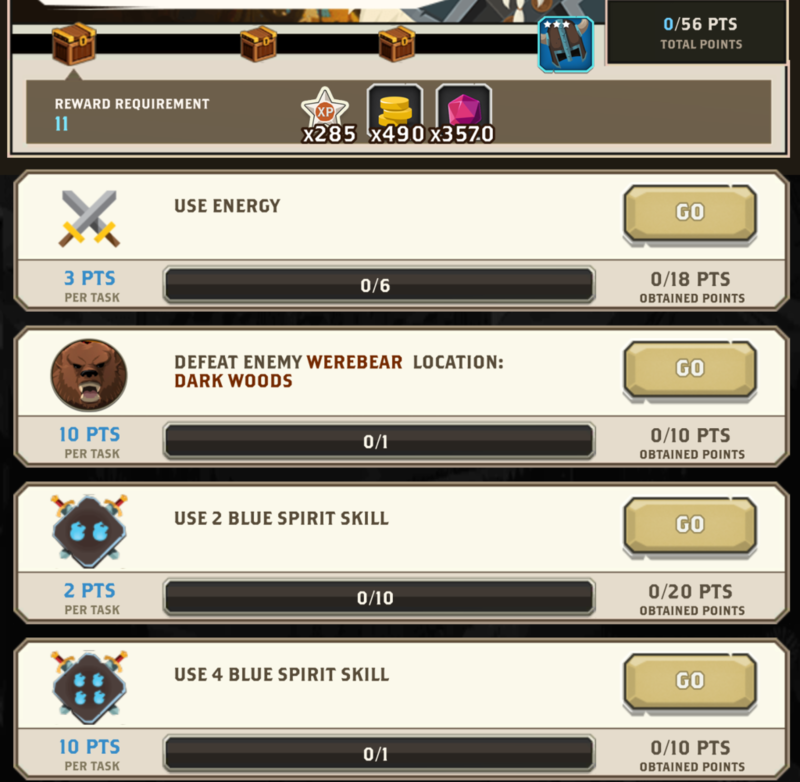 Within each quest group there are different tasks. Each task gives you a certain amount of points that you’ll need in order to reach the different reward milestones for the quest group. Upon completing all the tasks, you will receive the main rewards for the quest group. These quest groups are an excellent source of XP and Talents, so they are definitely worth doing. The first of the three groups will have Battle and Campaign-related tasks. These include defeating certain bosses or enemies, using certain spirit colors, and even winning a battle without using specific spirit skills! This will change how you do battle and will add an extra element of strategy and fun to completing quests. The second group of quests will be related to doing various miscellaneous things all over Valia. This includes completing voyages, crafting certain items, obtaining specific types of Gear and more. The last group of quests will have only a couple of tasks and they’ll be related to Gear and Leveling Up. 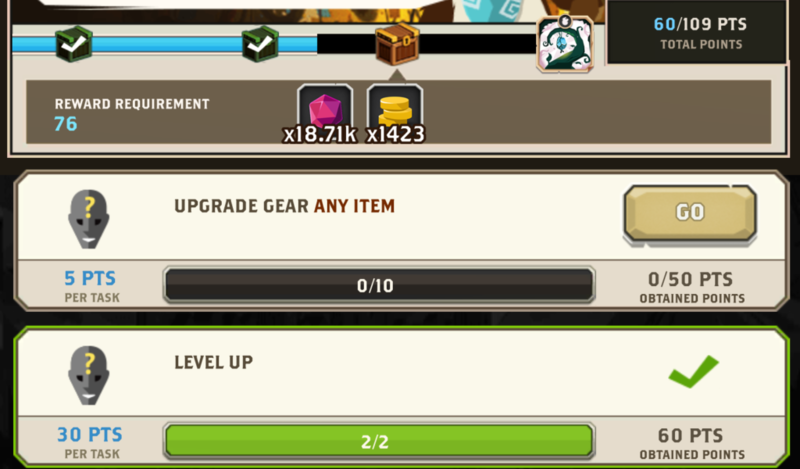 These tasks include “Upgrade Gear” and “Level Up”. They will push you to continue getting stronger and stronger and reward you with Gold, Eternium, and always Talents! Quest Events are side events that happen from time to time. 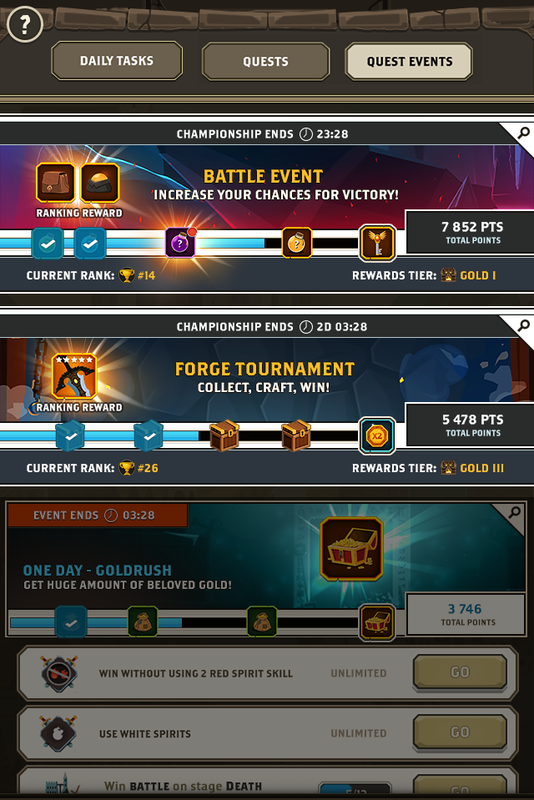 There are two types of Quest Events: Standalone and Championship Quest Events. These QEs usually last a short period of time (24 hours up to a couple of days) and will offer rewards via milestones and additional rewards through rankings. These QEs will have different tasks to complete that will grant you points. Your ranking depends on how many points you have relative to the other players in your ranking group. These QEs can last several days and will have competitive ranking groups. The rewards are very lucrative, meaning a lot of players will be competing to get the top score in their group. 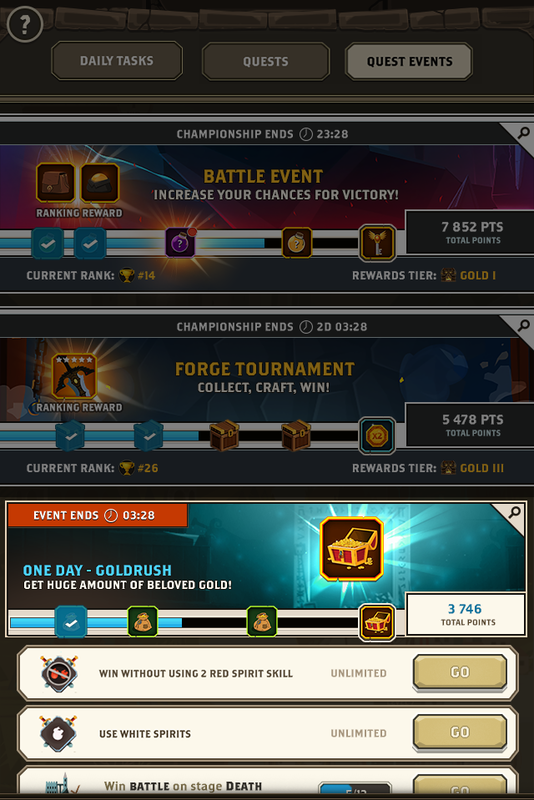 Championship QEs can be comprised of smaller, shorter QEs that will reward you with a special item, event materials, that will give you points in the overall main Championship QE. The key to success is to do well in the smaller mini-QE over time to score points in the long Championship QE. The mini-QEs are sprints and the Championship is a marathon! Mini-QEs usually last 24 hours and are back-to-back throughout the entire main Championship Quest Event. 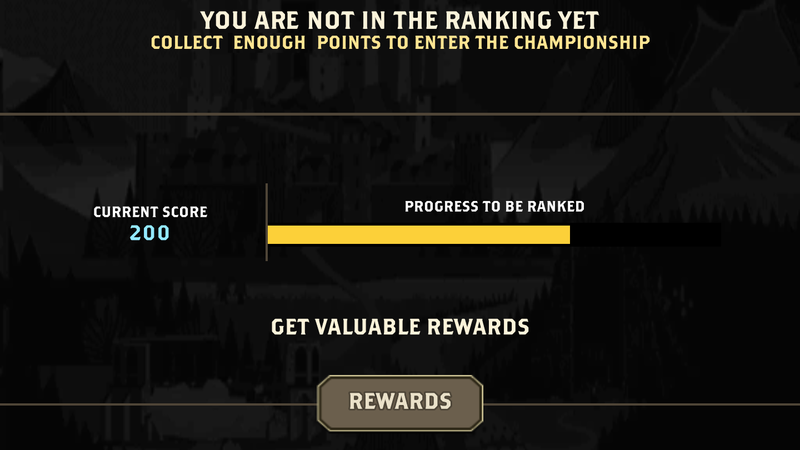 With the new Quest Event interface, you’ll now be able to see the ranking rewards even if you’re not in the rankings! This feature was highly requested by the community and we think this will make choosing which Quest Event you should participate in a lot easier than before. Quest Events are still a work in progress and they may take many different forms in the future, so be on the lookout for any changes that may happen regarding these types of quests! Check Out Our Video Summing Up The New Quests!